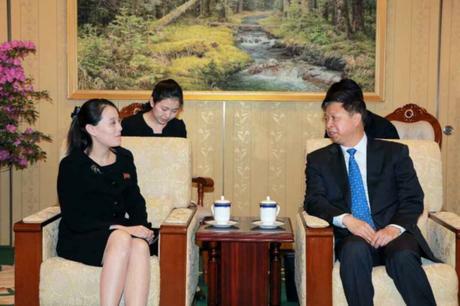 Kim Yo Jong (left) meets with CPC International Liaison Department Director Song Tao in Pyongyang on April 13, 2018 (Photo: Rodong Sinmun). Kim Yo Jong (Kim Yo’-cho’ng), deputy chief of the Personal Secretariat and Senior Deputy Director of the Workers’ Party of Korea [WPK] Propaganda and Agitation Department, met with Song Tao, Director of the Communist Party of China [CPC] International Liaison Department at his accommodation on April 13 (Friday). She visited Song in relation to his leading a visiting Chinese performing arts troupe visiting the DPRK for Sun’s Day (KIS’ birth anniversary). Her visit was made in the context of the PRC having elected to resume its relationship with the DPRK along a party-to-party basis as against, from 2013 to 2018, a state-to-state basis. Yo Jong “welcomes the Chinese art troupe’s visit to the DPRK once again.” She “exchanged greetings and had a talk with Song Tao in an amicable atmosphere.” Kim Yo Jong also met with the head of the Chinese National Ballet.